Public Relations agency Media Panache Nigeria alongside leading the web hosting company WhoGoHost have rendered a free training to over 100 youths in web design & use of social media at #BabeInLagos17, which held on Friday, June 30th, 2017 at Empowerment Centre, Allen Avenue, Lagos. 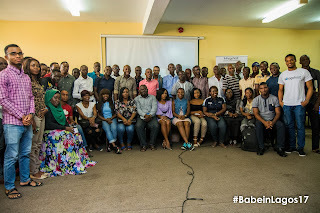 Tagged "Building Business Empire #BabeinLagos17", attendees of the training were taught how to simply create a website in today's contemporary digital age and how to increase business opportunities online using social media. The training was facilitated by WhoGoHost CEO Toba Obaniyi & Media Panache MD Timilehin Bello. Toba taught attendees several steps of web designing in a pragmatic manner while Timilehin rendered his expertise in digital media and social media amplification; teaching attendees myriad of tools and ways they can put their offerings on a larger pedestal, which will, in turn, bring about continuous progress on a long-term basis. Attendees were given the opportunity to ask questions regarding each topic they were being taught, hence facilitating an undeterred flow of understanding among them. Other germane facets of web designing like the use of widgets, third party platforms and more were also expounded. The training ended on a boisterous note, with attendees taking pictures to commemorate the training's first edition.